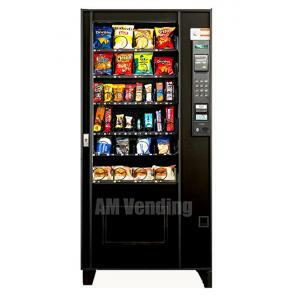 The AMS 35″ is an ideal machine to vend snacks and sandwiches in a small location. AMS 35″ Snack-Food Combo is a great machine for a small location. Whether you are hungry for a snack or want something larger like a sandwich the refurbished AMS 35’’Snack Food Combo can take care of it. The AMS 35’’ Snack-Food Combo can sell snacks and sandwiches in one machine. The good thing is that this two in one Snack Food vending Machine could be fitted in both, the small and the medium locations. In small to medium locations you can use the AMS 35″ Snack-Food Combo instead of purchasing two different machines. The AMS 35’’ Snack- Food vending Machine gives you the freedom to choose from your choice of snacks and sandwiches. We never let a vending machine go out the door until it looks and works like brand new. With the amount of years we have been in the business we know what the machine needs to work problem free. We not only sell you the machine but take care of the service after the sale. Optional: credit card reader available, $299.00 installed. Optional new changer and bill acceptor package can be installed for an additional $309.00 with a 2 year warranty.